There were three refugee camps in Bari. 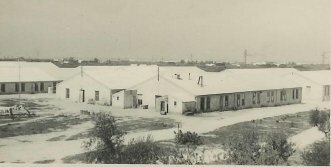 Alex worked with the British unit and later became the Assistant Director of one; Vera worked as an intepreter and also as manager of the hospital laundries at Bari and Brindisi. They both got paid by the Allies, wore British uniforms and received rations from Alexs and Veras work. The cooks took good care of Vera (it was a joke that she received better rations than her commanders). After the Allies left, they worked for the International Refugee Organization. At first, the family lived in town. One day when Vera was walking along the beach in the rain, a great dane bounded up to her with a British major trailing. The major ordered her not to move and quickly muzzled the dog. They got to talking and it turned out that the major controlled the town for the British. His intepreters were sick and he had to interrogate Italian and German prisoners, so Vera offered to help him. During the interrogation, the German agreed to everything whereas the Italian found an excuse for not doing anything. To prod him, Vera dropped Field Marshall Montgomerys name and the Italian snapped to attention and agreed to everything immediately. When Vera told the Major what happened he loved it, and that night at the officers club, Vera and Alex saw the major with a group gleefully recounting the story of the 17-year-old with the smart mouth. The major wanted to help them, so he gave them a choice of housing; they selected a huge villa on the sea which belonged to Italians who had been kicked out. They had been there only a month or two until they realized they had gone overboard (Mariannes main concern was who would clean the place! ), so they moved into the smaller villa next door. Eventually, they moved back into the town into an apartment, in which they stayed until they left Italy. The large villa was turned into an officers mess/housing. The young officers all cultivated the mother so they could get closer to the daughter. Marianne mentioned that she liked men to wear ties, so they showed up in bathing trunks and ties. Even Marianne enjoyed that! Vera used to go swimming early in the morning by herself and travel far out into the sea. Marianne told the officers about Veras solitary swims and soon enough she had a lot of company at 6:00 each morning. Alex and Vera went sailing with friends on a beautiful sailboat. Some were wearing bathing suits, the others party clothes. The two decided to have some fun. They made sure to wear bathing suits and once they got out to sea, Vera fell overboard and Alex shouted that she couldnt swim. All the boys dived in to save her--unfortunately for them, most of them had clothes on. Although their humor wasnt necessarily appreciated, no one was truly angry. On All Saints Day, it was customary to visit friends and accept refreshments, which in Italy of course included wine. Alex and Vera decided to tease their mother and pretend that they were drunk. Alex, though, decided that only he should act drunk since Vera did not make a credible drunk. They returned home and Alex stumbled around--his act was terrific. Marianne became quite upset and then, since Vera was laughing so hard, she began yelling at her daughter that she was drunk too--worse than Alex. In true Baba fashion, she was concerned about Alex and mad at Vera. It took them two days to convince her that they were kidding. So Alex and Vera enjoyed themselves. Alex dated many of the Italian girls. Girls in general (whatever their nationality) were at a premium, so Marianne never let Vera go out by herself. Alex always had to be her chaperone and they had a picture of themselves with a baby to whip out if things got too intense. Still, it was fairly obvious that they werent husband and wife because of their similar mannerisms, although not everyone could tell. Vera worked for ORT (Organization for Rehabiliation and Training). Once she needed rooms for training and went to Major White, who headed the camp where Alex was the assistant director. Not knowing that Alex was her brother, the Major refered Vera to Alex saying, Alex cant resist a pretty girl. So, Vera bet him that he absolutely could resist her; later she owned up to the truth, but he still lost the bet. But there was also a terrible side to living in Bari. Vera processed new refugees and had nightmares from hearing all the horrific, unbelievable stories. The Germans used to kill everyone in a family except for one member (believing that there was no reason to be vicious and cruel if no one was left to suffer). In the refugee camp, a man and woman who had each lost their families met and decided to marry. She wanted a white dress, so Vera went to a store and found not only a dress, but a white purse, hat and shoes for her as well. The woman was so grateful at the simple act of kindness that she burst into tears. She got pregnant (giving birth to a sickly baby), contracted cancer and soon died. Her husband went berserk and barricaded himself with his baby. Everyone tried to help (the commander, the welfare officer), yet all attempts at assistance were met with rocks. Finally Vera came to help and also was hit; however, when Vera was hit he started crying and she walked in and took the baby to safety. The man received therapy and ended up going to Israel with his child.